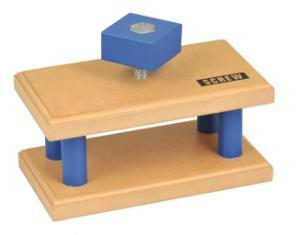 This wooden machine has a sturdy wooden construction ideal for classroom use. The large block mounted around the head of the screw gives students additional leverage so they can easily break eggs or squish other objects with the screw that would be difficult to break with their bare hands. The square top also makes it easy to measure the distance top of the screw is turned vs. the distance the screw is sent into the board. Includes an instruction manual to facilitate students and teacher use of the apparatus.